Honey can vary widely in color, aroma, and taste depending upon the flowers that the bees are foraging. 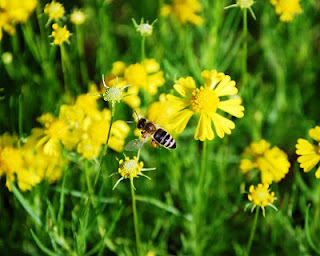 Flowering plants compete with each other for available insect and animal pollinators. Those that are successful in attracting pollinators are the more likely to reproduce and expand their territory. The plants compete by offering to the pollinators different aromas, flavors, and concentrations of sugars in their nectar. Since honey is made from concentrated flower nectar, the differences in the nectars make for differences in honeys. Flowering plants have evolved to present their blooms to the pollinators at varying times during the year. By staggering the bloom dates, plants are able to lessen the competition for available pollinators. This results in honeys that taste different at different times of the year. Having a continuous series of flowering plants coming into bloom also provides for good honey bee nutrition. 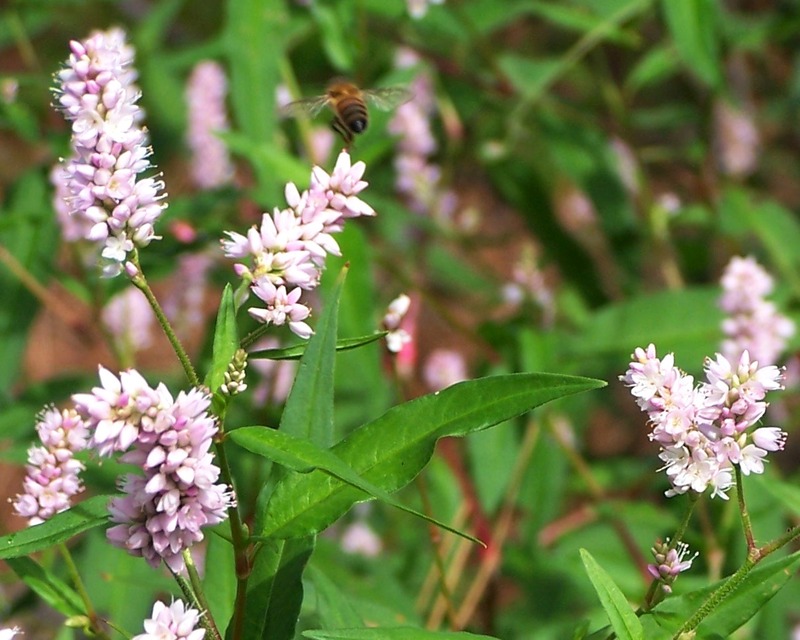 Smartweed, also known as pinkweed, is a prolific flowering plant of the damp ground along ditches and waterways throughout the Arkansas Delta. Smartweed is found around the levees of rice fields. Its pink blooms attract great numbers of honey bees in the early fall. After smartweed is pollinated by honey bees, it produces large amounts of seed which propagate the plant and provide food for ducks and other birds. Smartweed, related to buckwheat, is one of the plants that produce robust-flavored honeys, stronger in aroma and flavor than the light honeys of the spring and summer. Other plants adding nectar to the stronger fall honeys are bitterweed, and fall asters. We consider the smartweed quite a beneficial plant for the honey bees. It is almost always a consistent producer of large volumes of nectar at the time of the year when the bees need to be building up stores of honey for winter. Smartweed was used as a medicinal plant by the pioneers who treated the legs of lame horses and mules with a liniment made by boiling the plant’s leaves. As long as people have been keeping honey bees, they have encountered wax moths. Wax moths are hive scavengers. These common moths constantly attack honey bee hives. The adult moths light on the outside of the hive and lay eggs. The young larvae crawl through the cracks between hive body boxes. Entrance locations are few, because the bees seal the cracks with propolis, or bee glue. Most wax moths that enter are killed by the worker bees. Once inside the hive, the wax moth larvae are voracious eaters. Even though their name is wax moth, they don’t feed on beeswax alone; they primarily feed on protein. Wax moths are attracted to the protein of stored pollen and silk cocoons of old brood comb. The pollen is used by the colony to make food for developing honey bees. When honey bees emerge as adults after passing through the stages of egg, larva, and pupa, they leave behind the woven silk cocoon in which they developed in the pupal stage. 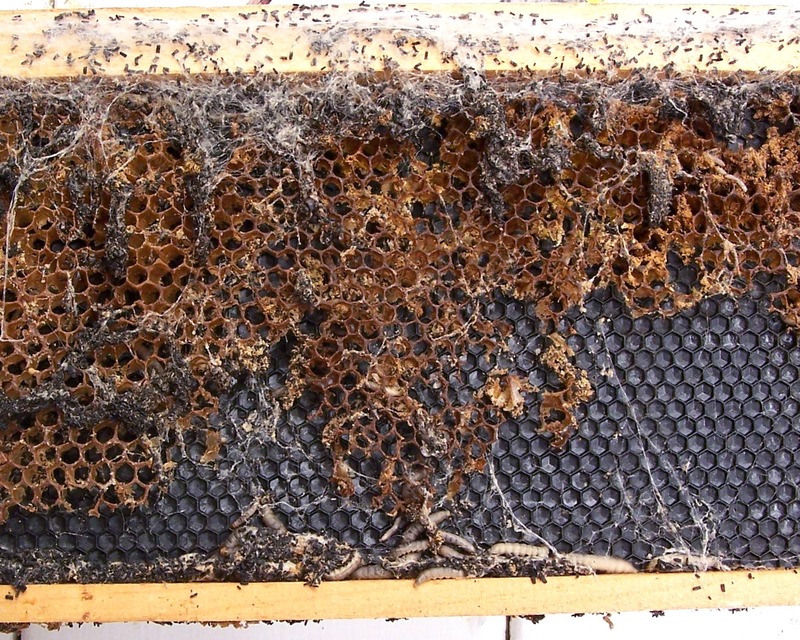 Beekeepers over hundreds of years have complained about opening a bee hive only to find a mass of webbing caused by the voracious eating of the comb by wax moth larvae. Many find the population of honey bees depleted and the frames covered in webbing. They often conclude that the wax moths killed the colony. Actually, the wax moths usually take over a hive after it becomes hopelessly queen-less or dies. Peace Bee Farm uses the efforts of wax moths to clean brood frames of old comb. Frames from winter colony losses can be placed in empty hives and used as bait hives during the spring swarm season. If a swarm is not lured into the bait hive, wax moths will eat the comb and leave plastic foundation clean and exposed, as shown in today’s photo. We then paint the foundation with our own chemical-free cappings wax, saved from the previous year’s honey harvest, as part of our integrated pest management program. Honey is truly a unique food. It is the only food that we eat that was produced by an insect. It is also the only food that remains unchanged from that which was gathered by our cave man ancestors thousands of years ago. Honey is concentrated flower nectar mixed with enzymes that the honey bees produce. Honey is the only food that will last indefinitely at room temperatures without spoiling. Bacteria cannot grow in the highly concentrated sugars that make up honey. The honey bees do all of the hard work of turning nectar from flowers into honey. The beekeeper’s task is to take the pure honey from the bee hive and place it into appropriate honey containers without damaging its color, aroma, and taste. It is important for the beekeeper to control the moisture content of the extracted honey. We measure the moisture using an instrument called a refractometer. Bees cap the honey when they have evaporated it to 18 percent moisture content. With excessive moisture, fermentation can occur. Honey readily takes on and gives off moisture from the air, so we carefully control the atmosphere of the honey house. In the humid Arkansas Delta, we often run a dehumidifier and fans when frames of honey are being handled. 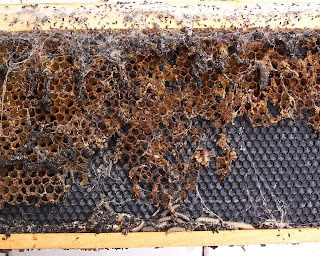 After the frames of honey have been removed from the hives, cleared of bees, uncapped, and the honey extracted, the debris, mostly flecks of beeswax, is removed by straining through a fine mesh cloth. The honey is then placed in a bottling unit and allowed to settle for a day or more. Since honey is quite heavy, any residue remaining in the honey will rise to the surface. Pure honey is then be poured from the bottom of the bottling unit. Honey that is to be stored for bottling at a later time is sealed in containers and labeled with the date harvested, location, nectar source, honey color, moisture content, and weight. Rita bottles some light amber Delta wildflower honey. 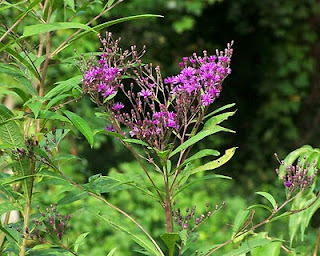 Joe-Pye weed is a late summer blooming wildflower found in damp ground along the edges of streams, ditches, and forest margins. I came across a patch of Joe-Pye weed in bloom in a marsh adjacent to a pond on our farm while watching a flock of gadwalls, gray, early-migrating ducks. Thin flocks of gadwalls, American wigeons, wood ducks, and green-winged teal can be seen in the Mid-South in September. The colorful Joe-Pye weed, a member of the important family of bee plants, the composites, often stands over eight feet in height. The composites, or sunflowers, are significant producers of nectar and pollen. Legends attribute the name of various species to a New England colonial-era Native American medicinal healer named Joe Pye. It is said that he treated conditions such as diarrhea, typhus, kidney stones, and fevers with the plants which now carry his name. One species of Joe-Pye weed, boneset, is thought to benefit in setting broken bones. This white-flowered plant is a major producer of nectar for late-season honey at times. Another Joe-Pye species with white flowers is white snakeroot, a poisonous plant. The flowering plants benefit from pollination by bees, and many serve as a source of medicine for humans and animals. Late summer is an important time for beekeepers to observe the condition of their bee hives. In August, Chris Harrell noticed a change in activity in his Eastern North Carolina hive. Brood production had stopped. He found a number of queen cells that had been torn down from the sides. It appeared that the colony had superseded itself, and a virgin queen had killed the other developing queens. In his region, August may be the last month that a queen may successfully mate. Chris found young brood in September; it appears that the colony was successful in replacing its queen. He even found a young queen running rapidly across the surface of the combs. Virgin queens and young queens are often quite shy. Things don’t always go as planned. Tod and I harvested a truck load of honey from one of our bee yards and then headed for the honey house. A short time later, a hose fitting broke; and engine coolant started gushing out. With the truck disabled, we stopped and called for a wrecker to take the truck the short distance from Memphis to a repair shop in West Memphis. Loading the truck, the wrecker driver accidentally knocked over a concrete street light, which crashed onto his wrecker. The electric company’s lineman responded to handle the exposed wiring. Police officers arrived to investigate the accident. Another wrecker was called in, and the truck was transported to West Memphis and remained safely in the garage overnight loaded with supers full of honey. The following morning, the mechanics ordered parts and pushed the truck into the parking lot where it remained throughout the day. While the truck was in transit, covers protecting the honey supers had shifted enough to allow robber bees to enter. They carried away about three hundred pounds of honey before the truck was repaired. We shouldn’t measure the harvest until the honey is extracted and stored away. 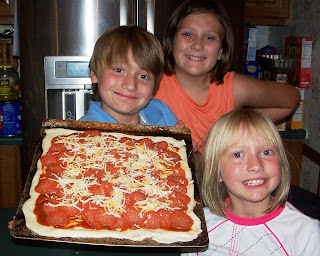 Meanwhile, the beekeepers’ helpers, Ethan, Ashlyn, and Erin, proudly display a home-made pizza before placing it in the oven. Our grandchildren spent the night with Rita and I. 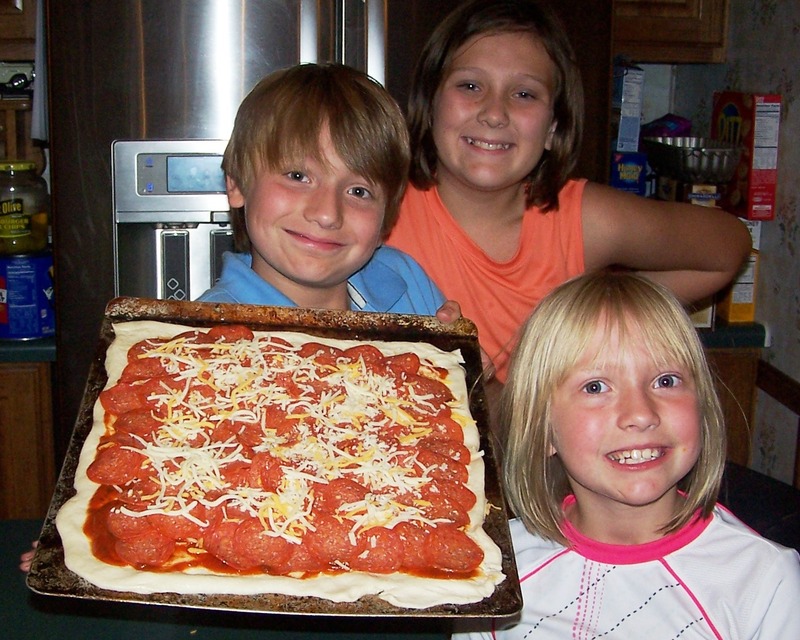 They planned and assembled pizzas, played Boggle, watched Jackie Chan movies, fed ducks, geese, and chickens, and visited the honey house. Each of the children participates in various tasks involving beekeeping. Their other set of grandparents keep bees in Tennessee. Ashlyn’s parents moved a Louisiana bee yard damaged in Hurricane Katrina into new hives. Just as the children enjoy planning and making pizzas, they also help create honey soaps that are quite popular at farmers markets. The children help by suggesting mold shapes, textures, colors, scents, and names for the products. Their soaps make an attractive presentation along with honey and other bee hive products. The honey harvest is well under way, and light summer-time honey is flowing from Peace Bee Farm’s extractor. We’re collecting frames of honey one day and extracting it the next. Whenever honey is flowing from the extractor, it is the end result of having the bee hives placed in an area with adequate nectar sources for the number of hives. Weather conditions affect the nectar flow as well. Excessive rain can keep the bees from flying and dilute the nectar; drought can stop the plants from producing nectar. Timing is important. The beekeeper must have an adequate number of honey supers in place on the bee hives before the major nectar flows in order to take advantage of the bees’ honey production. The colonies need a large population of foraging-age bees and a queen laying a large number of eggs when the flowers start blooming. The beekeeper should take steps to help control swarming. If a colony swarms, it will not produce a surplus of honey that year. Each locale differs in the honey produced by the honey bees. For example, our honey produced on different sides of the Mississippi River varies in color, aroma, and flavor. The timing of the nectar flow also differs. Experience tells the beekeeper when the different nectar flows occur in an area. Observing the blooming of the various nectar-producing plants and regularly checking the build-up of honey in the supers lets the beekeeper harvest a crop of surplus honey. This year, many of our colonies built-up large stores of spring-time honey and then early summer honey; but some nectar flows stopped abruptly with weeks of hot, dry weather later in the summer. Beekeepers producing honey should record the honey harvested from individual bee yards over a period of several years. At times it is best to move the hives from a bee yard that performs poorly. The problem may be lack of adequate nectar resources, soil conditions, or chemicals used in the area. The invention of the honey extractor was one of the great advances in beekeeping of the mid-1800s. The honey extractor was developed shortly after Philadelphia pastor L. L. Langstroth built the first modern bee hive. The hive, built around the concept of bee space that Langstroth had observed in nature, held removable frames of honeycomb. With removable frames, the honey could be extracted in a convenient and nondestructive manner. Earlier methods of collecting honey involved cutting or breaking pieces of honeycomb from the colony’s nest in a hollow log or a bee skep made of straw. The honey was obtained by mashing the honeycomb and squeezing out the honey. The method was effective for collecting honey and beeswax, but it destroyed the honeycomb. The honey obtained was often of lesser quality as well, because the comb likely held some brood. Using removable frames and a honey extractor, the beekeeper could harvest honey and save the honeycomb for reuse by the bees in the following year. Reusing the honeycomb saves the bees a considerable amount of time required to draw-out new honeycomb. Also, a great amount of resources in honey must be consumed to rebuild the next honeycomb. For the bees to produce one ounce of beeswax, they consume one pound of honey. In today’s photo frames of honey spin in the Peace Bee Farm honey extractor. The beeswax cappings covering the honey have been cut away using a sharp knife and scratching tool. 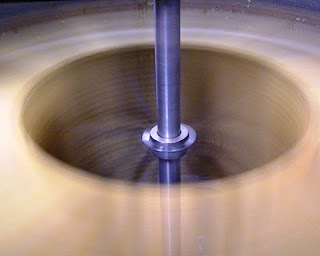 Centrifugal force pulls the honey from the open cells of the honeycomb. 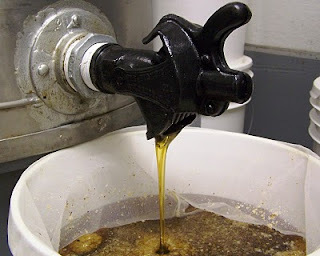 As the honey flows from the extractor, it is strained of flecks of beeswax and any foreign matter. Traces of pollen remain in the honey. The honey is collected and sealed in honey pails to be bottled as needed. Each pail of honey is sampled for taste and aroma, and the honey’s moisture content is measured. Bee yard, nectar source, date collected, honey color, and weight are recorded. Once the frames of honey have been removed from the bee hives, they are taken to a facility, usually called a honey house, where the honey can be removed. Honey houses are clean work areas housing the equipment for handling the honey. When the supers of honey first arrive in the honey house, they may be held for a day in a warm room to ensure the honey will flow freely. Honey readily absorbs moisture from the atmosphere, so it may be necessary to have a dehumidifier running to dry the air in the room. When the bees make the honey, they ripen it by evaporating the water in the honey. When the water content reaches 18 percent, the honey bees cap the cells of honey with beeswax. Once the cells are capped, the honey is in a condition that will last indefinitely. It is important that the honey be handled soon after it is brought into the honey house. If small hive beetles were brought into the honey house in the frames of honey, the beetle larvae can damage or destroy the honey, beeswax, and frames of honeycomb. The first procedure performed in the honey house is the removal of the beeswax cappings to expose the honey. The cappings may be removed by machinery, or they may be cut off by hand. Beekeepers often use a heated knife to remove the cappings. Caution should be observed when using a hot knife, as any heat applied to the honey can alter its color, aroma, and flavor. At Peace Bee Farm we prefer to use a sharp, serrated, unheated knife. 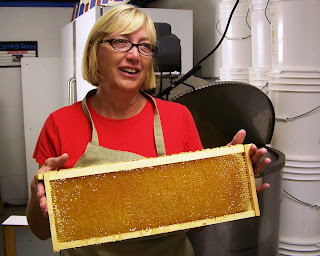 In today’s photo, Rita holds a frame of uncapped honey, ready to be placed in the honey extractor. After the honey is removed in the extractor, the frames are stored over winter to be returned to the hives in the spring. The cut-off beeswax cappings hold some honey which is collected when it is allowed to drip overnight into the uncapping tank. It is honey harvest time, and there are many ways to accomplish the removal of the honey from the hives. 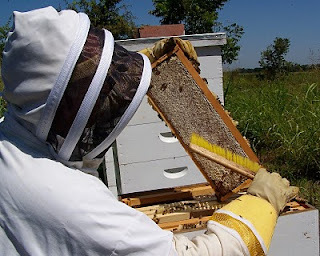 When deciding upon a particular method to use, the beekeeper should consider the time available, amount of labor required, and the stress placed on the bees. Stress is a concern, as honey bees under stress give off alarm pheromone which attracts small hive beetles from great distances. Small hive beetles are honey bee nest scavengers; and they often wait in one hive, even a strong one, until they receive pheromones signaling that a colony is queen-less or under stress. All methods of removing honey from the bee hive require the beekeeper to remove the bees from the frames of honey. A common method of removing honey from the bee hive used by many beekeeping operations employs an offensive-smelling chemical placed on a fume board to drive the bees from the honey supers. This is often matched with the use of a blower to blow the bees from the frames. The method is effective, but somewhat stressful on the bees. A more gentle method that we use at Peace Bee Farm involves removing the bees, one frame at a time, using a brush. Flick the bees gently off their feet with the brush and they will fly back into the hive. Long, sweeping motions roll the bees and quickly upset them. Smoke can be used to help drive the bees down into the hive. We control the moisture in the honey by only harvesting frames that are almost completely capped with beeswax. Bee escapes fit into the oval hole in a bee hive inner cover. The bee escape can be placed under the supers; and when the bees leave the super, they cannot return. The beekeeper returns on another day to harvest the honey. However, bee escapes are only effective when the weather is cool enough for the bees to leave the supers to cluster together in the brood nest at night. Nature generally restores the land, plants, and animals after disturbance. In my recent travel across the American West, I came upon two large-scale examples. 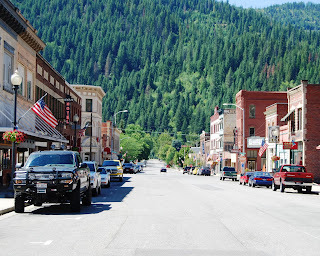 First, I visited in the town of Wallace, Idaho on the one hundredth anniversary of the great fire of August, 1910, the largest fire in American history. The forests are completely re-grown and there remains no evidence of the massive fire, which killed 90 people and destroyed most of the silver mining town of Wallace. 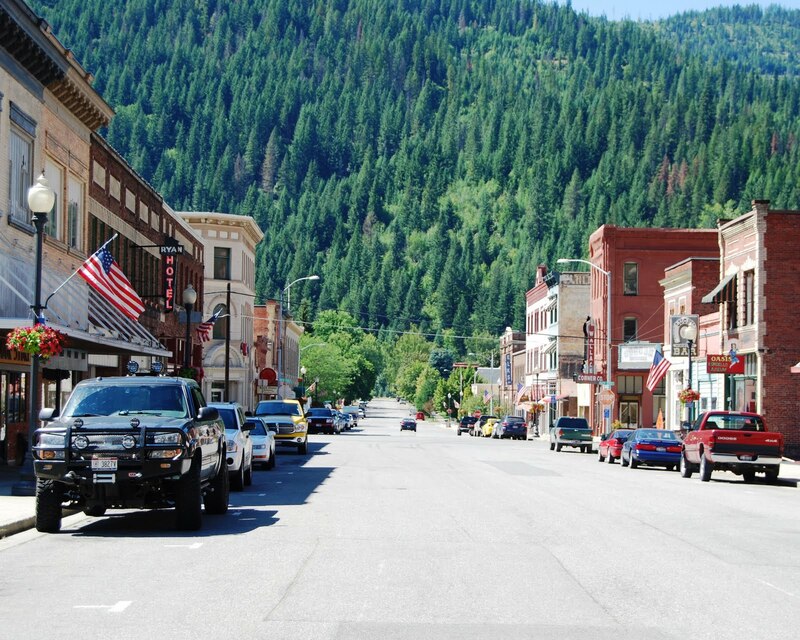 Wallace, in today’s picture, is recognized as the location of the fictional movie, Dante’s Peak. Next, I travelled through Yellowstone National Park, which encountered massive fires in 1988. The fires, mostly caused by lightning, spread rapidly along the ground, fueled by a heavy layer of debris from evergreen trees damaged by pine bark beetles. Today, after 22 years, evergreen trees stand 10 feet high among the scorched trunks of trees killed in the fire. Grasses and wildflowers cover the ground where sunlight now encourages growth. Some mountain slopes are carpeted in pink blossoms of fireweed, often the first flowering plant to arise after a forest fire. I observed large numbers of animals thriving in the re-growth of the understory plants. A mule deer browsed on a diverse stand of wildflowers. A spruce grouse and her clutch of chicks moved cautiously between tufts of native grasses growing next to bubbling volcanic mud pots. The resiliency of nature gives me hope that our honey bees will rebound from the simultaneous attacks they have encountered from numerous sources: pests, pathogens, chemicals in the environment, and the stresses placed upon the bees by the beekeepers. We often attempt to use the honey bees as agricultural tools to pollinate food crops grown in mono-cultural plantings which don’t afford the bees adequate or complete nutrition. The honey bees should respond to efforts to breed resistance to parasitic mites and other pests and pathogens. Chemicals can be prudently applied, and nutrition improved through diverse wildflower growth. Bitterweed is now in bloom along the dry, rocky edges of gravel roads and in bare, unplowed fields. This bright yellow wildflower in the composite, or sunflower, family is a late summer blooming replacement to a series of yellow flowers that have covered the same ground throughout the year. The first was dandelion, which was followed by buttercups, groundsel, the mustards, and then tickseed coreopsis. By blooming in sequence, each plant is effectively pollinated by available bees. These plants have evolved a reproductive strategy that avoids competition for insect pollinators. Like other composites, bitterweed offers ample nectar and pollen to attract honey bees. Foragers, like the honey bee in today’s photo, are able to easily recognize bitterweed from other plants by its color and the shape and interrupted design of the flower’s petals. Click on the photo to see the bright orange-colored bitterweed pollen carried on the honey bee’s hind legs. Livestock will generally avoid eating bitterweed in a pasture, and it is said that it makes milk taste bitter if it is eaten by dairy cattle. Bitterweed is among a number of late summer and fall nectar-producing plants that give the late-season honeys a more robust flavor and aroma. Our reader, Alan Wood, recently published an insightful piece in bestcollegesonline.com titled, 10 Valuable Life & Business Lessons You Can Learn from Bees. For example, the listing explains that honey bees are excellent communicators and that they are constantly evolving. This thought-provoking writing can be found in the website’s blog post dated August 11, 2010. This website offers a number of other useful pieces, such as 12 Essential TED Talks for Writers. The TED Talks include video presentations from authors in technology, entertainment, and design. This website offers good advice to anyone considering an online educational program. It also contains tips for success in school useful for anyone. The piece on learning from bees was written from a good understanding of honey bee biology.